A guard on the prison planet of Takron-Galtos finally submits to the will of Saturn Queen, and frees her from her imprisonment. A Science Police cruiser approaching the planet is blasted and destroyed, revealing the unconscious captive passenger, Sun Killer. Lightning Lord gives him a little electric wake-up, and Sun Killer bows in obedience to his Saturn Queen. Sun Killer apologizes for failing to free her earlier, when Mon-El intervened. I love the art in this sequence, with Saturn Queen scratching his face and licking it. Portela was the main alternate artist for Cinar, with him filling in for a few pages or even entire issues, and their two styles blended well. 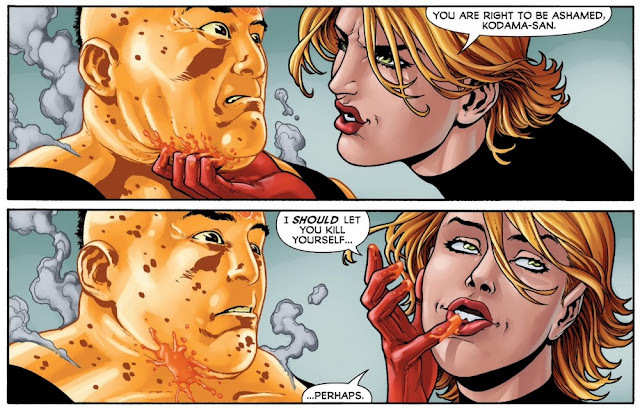 Which is why it’s all the more confusing that the New 52 Legion book, with Levitz and Portela, and a largely unchanged continuity, was so underwhelming. 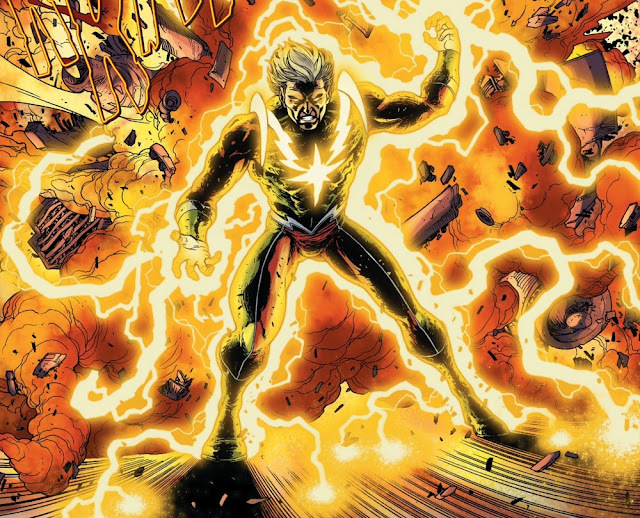 The prison riots all around them, with Saturn Girl using the chaos to mask their departure and destroy the data records of which prisoners have fled or died, and where the riot began. Clearly, she was touched by the mysterious blue light that appeared during Sun Killer’s previous rescue attempt (and is a little touched in the head to boot). 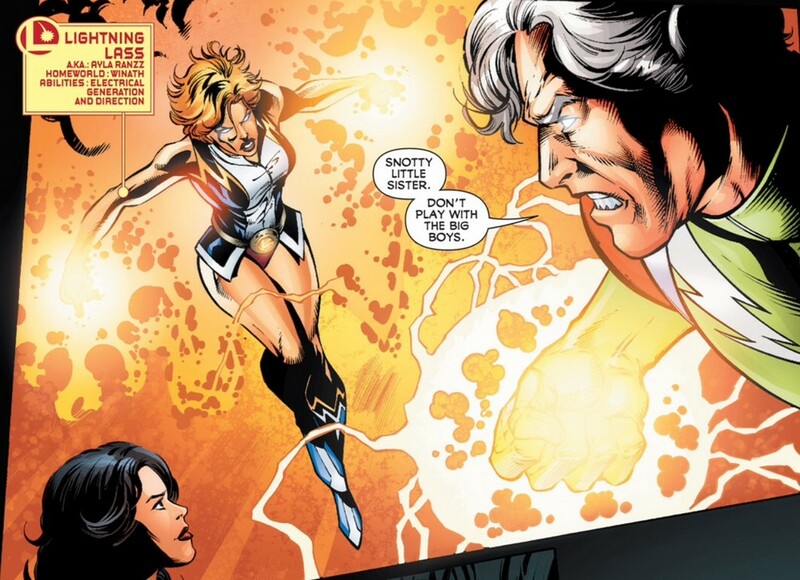 With no further use of her enthralled prison guard, she gives Lightning Lord permission to kill him. Later, Saturn Girl, Lightning Lord, and (the Coluan) Questor escape in a cruiser. The time in imprisonment only increased her powers, and along with the blue light shining in her eyes, she forces Lightning Lord to submit to her rule, and he abides. Her and Questor check on their passengers, prisoners hand-picked from the chaos mostly for surviving the riot in the first place. Sun Killer, Immortus, Akka, Micro Lad, Hunter, and Zymyr (who is a Gil’Dishpan, one of my favorite fictional alien races). This will be the start of the new Legion of Super-Villains. 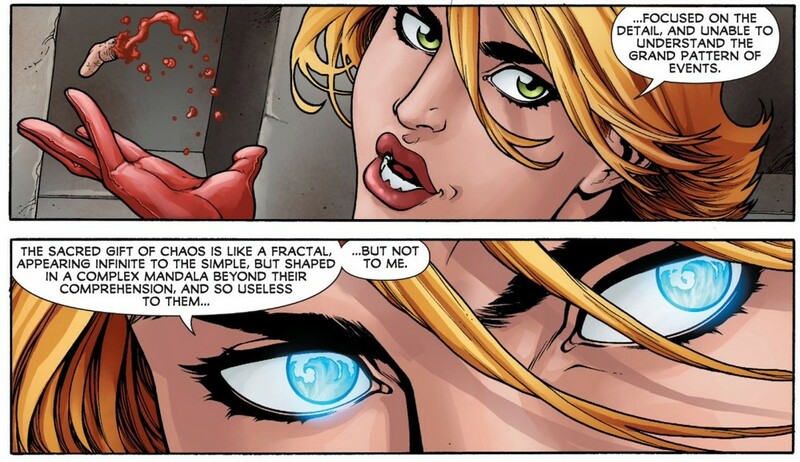 One of the best things about the Legion is that they historically have great villains, which have largely been unseen so far in the comics I’ve covered. The Legion of Super-Villains are largely all evil duplicates of the Legionnaires themselves. Most of the Legion members bear the same natural born abilities of the rest of their alien race. So it wouldn’t be hard to pull out an evil member of that same race to act in opposition to the Legion. Lightning Lad is the older brother of Lightning Lad and Lightning Lass. 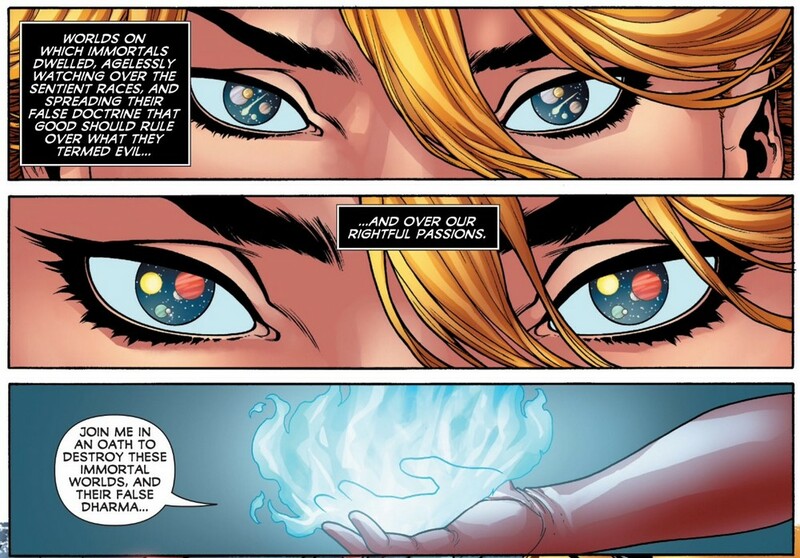 Saturn Queen is a powerful telepath from Titan. Questor is a super-smart Coluan. So on and so forth. I haven’t actually read that many stories with the Legion of Super-Villains, but the ones I have it’s always a pretty big deal when they show up. I’m almost certain that a Legionnaire died in both stories. Micro Lad bites it pretty quick, due to a knife in the back courtesy of Akka. She found him annoying, most likely. The blue light is what scared Dyogene so much earlier. I also remember coming up with the idea of drawing a solar system within a person’s eyes like the panel above. I was never good enough to pull it off to my satisfaction though. 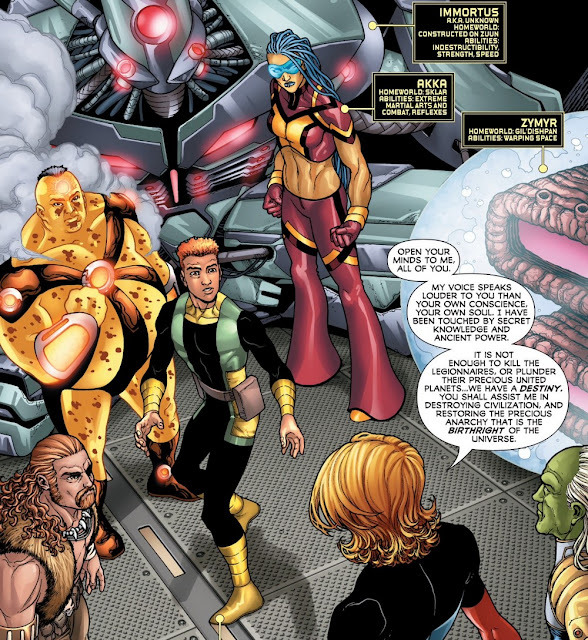 On Takron-Galtos, Wildfire and Ultra Boy arrive to help try and sort through the wreckage with the Science Police. They are doing what they can to figure out what happened without the data records, but from what little they can determine, it appears the trouble started in the specials cells where Saturn Queen was being held. 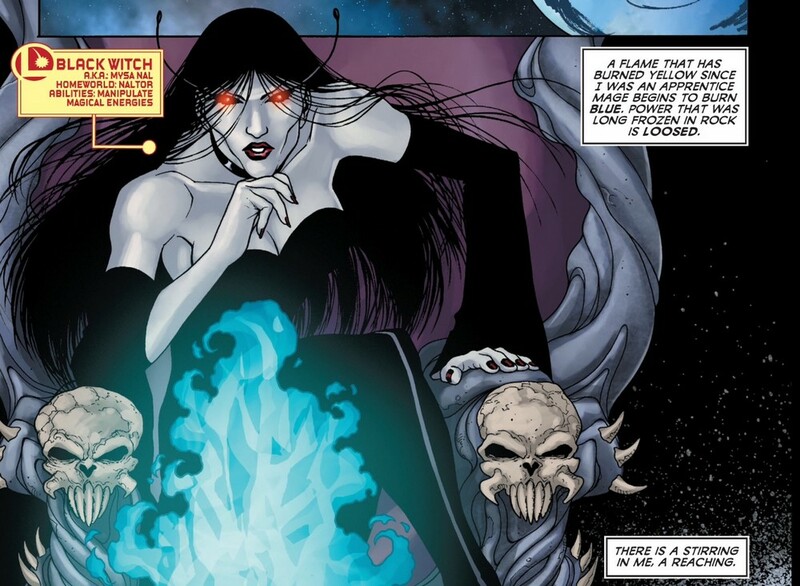 Saturn Queen uses her blue light enhanced powers to combine the teleportation power of Zymyr, with the tracking power of Hunter and Questor’s processing power. 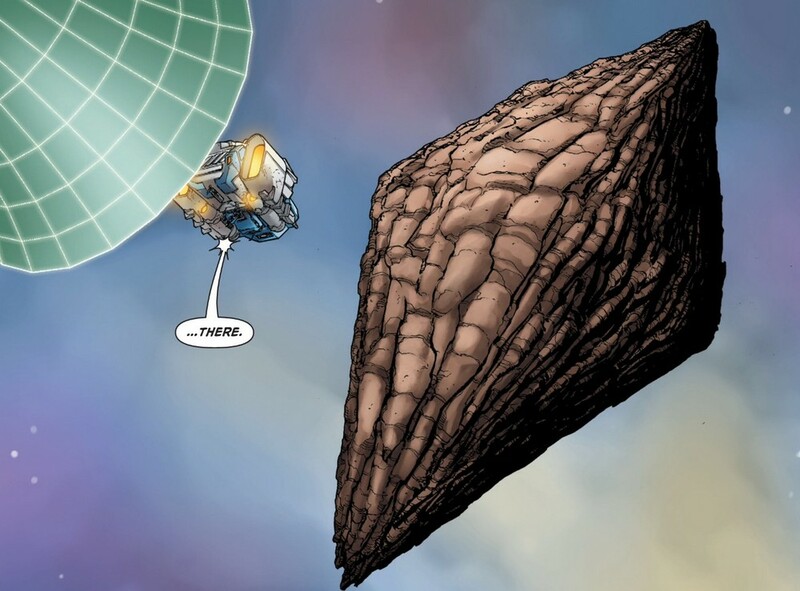 It opens a wormhole leading them straight to their first target: the Rock of Eternity. Duy just started paying attention. They begin to try to destroy it, but it’s unfazed by their conventional attacks. A magical pink being that Duy most likely knows the name of emerges from the rock. It looks like Ghast from the Demons Three, but it could also be one of the Seven Deadly Enemies of Man. Lightning Lord’s powers appear to scare it off. Saturn Queen, taking matters into her own hands, has them create two giant wormholes on either side of the Rock, pulling in two planets on a collision course with each other. They collide, destroying the Rock of Eternity. The Legion of Super-Villains depart. A mysterious hand reaches out from behind the shattered floating rocks. Saturn Queen leaves Akka and Lightning Lord on Rimbor (home planet of Ultra Boy, and a planet of lawlessness and seedy characters) to recruit more members for their Legion. Lightning Lord is getting increasingly angry about her ordering him around, despite his fear of her, and takes it out on the cruiser she ordered him to destroy. Saturn Queen and the rest of her Legion arrive on Colu, the second of the immortal worlds she has been tasked to destroy. Having already destroyed faith, now they intend to find and destroy the immortal world that represents wisdom. This is what makes comics fun. 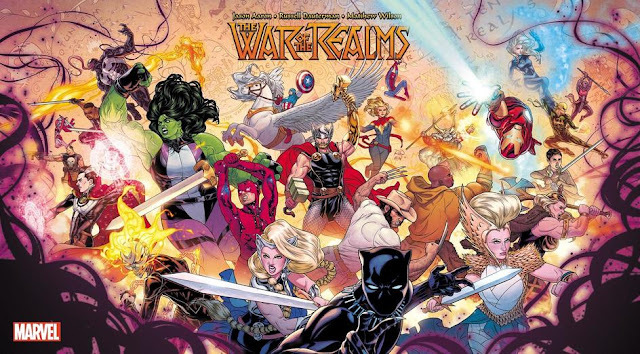 Most other superhero teams try to keep their lineups to a manageable number, which is great and all, but give me two armies of superhumans smashing into each other. I’ve always enjoyed large rosters of characters, going back to my Transformers days and the never-ending assembly line of toys and characters that needed to be sold into greedy little hands like mine. The Legion of Super-Heroes isn’t just a team, it’s very literally a legion of members, hence the name. Much like when Roger Stern determined that the Masters of Evil would never play fair, and attack the Avengers with a collection of villains that numbered less than or equal to the good guys, the Legion of Super-Villains roll deep as well. 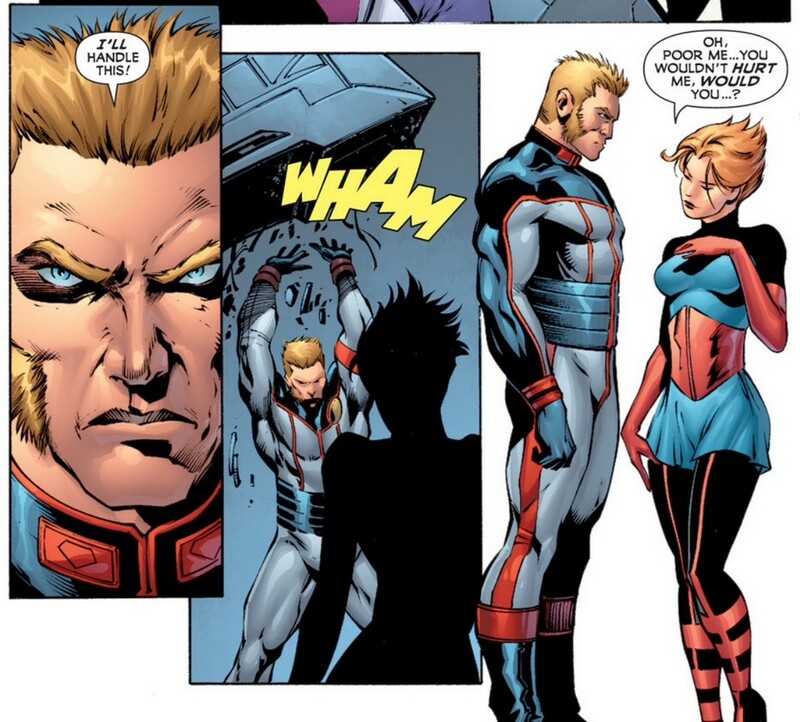 And like I mentioned before, Legionnaires tend to die whenever they show up. On Rimbor, Phantom Girl, Sun Boy, Lightning Lass, and Ultra Boy hunt down prisoners from the Takron-Galtos escape. 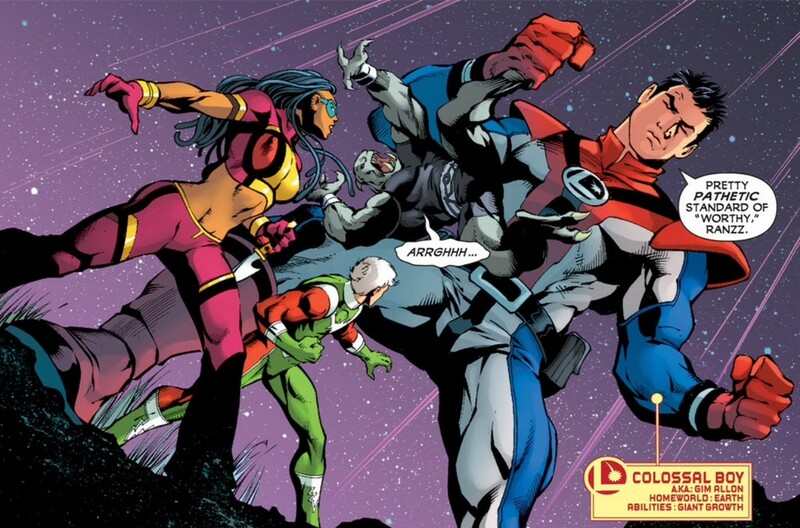 Outside, Tyroc and Colossal Boy round up anyone that slipped past them. They had received confirmation that it was in fact Saturn Queen that caused the break-out, and that she is back to Legionnaire hunting. 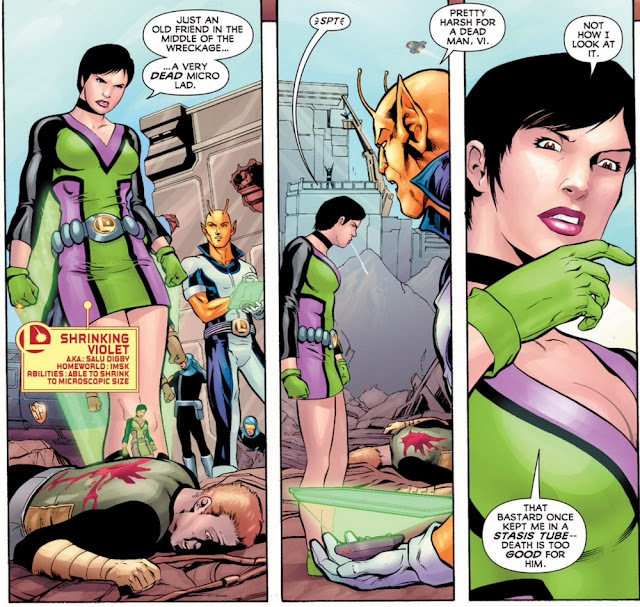 Cosmic Boy and Chameleon help with the cleanup and recovery on Takron-Galtos, and Shrinking Violet gives the just discovered dead boy of Micro Lad the goodbye she thinks it deserves. 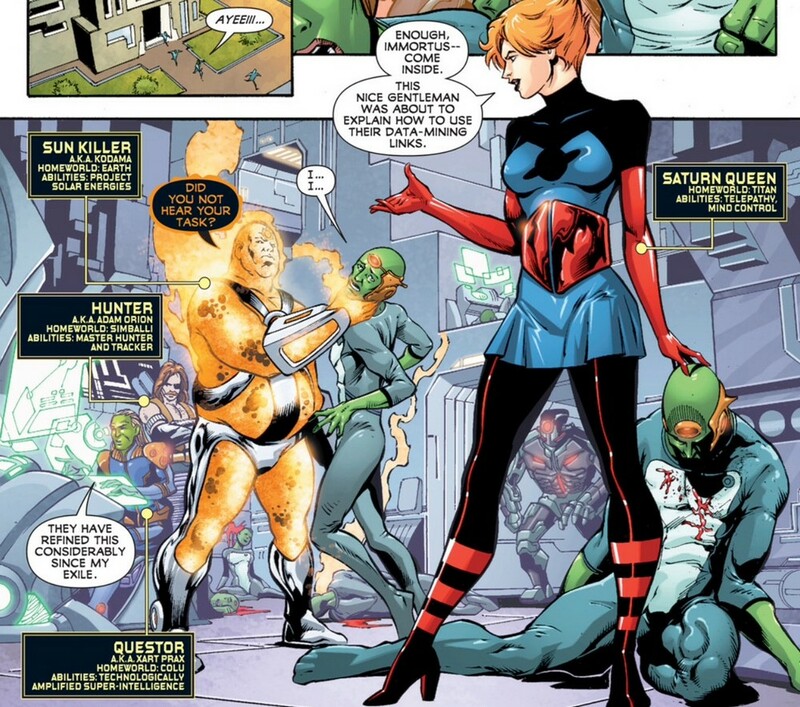 Brainiac 5, acting as interim leader, tries to convince Dawnstar to return and help with the escaped inmates, but she is busy tracking the blue light that put her in a coma before. Dream Girl returns with Star Boy, who she demands Brainy helps to fix (he went crazy when Brainy sent him back in time, undercover as a member of the Justice Society). Brainy believes a new Legion of Super-Villains takes precedence, but Mon-El returns in time to relieve him of command. Timber Wolf is in Japan, seeing if he can track down Sun Killer, but finds Sun Emperor instead. They fight. Brainy updates Mon-El on the prison escape, Dawnstar, Saturn Queen, and Colu shutting down all contact with the universe, before reluctantly leaving to help Star Boy. 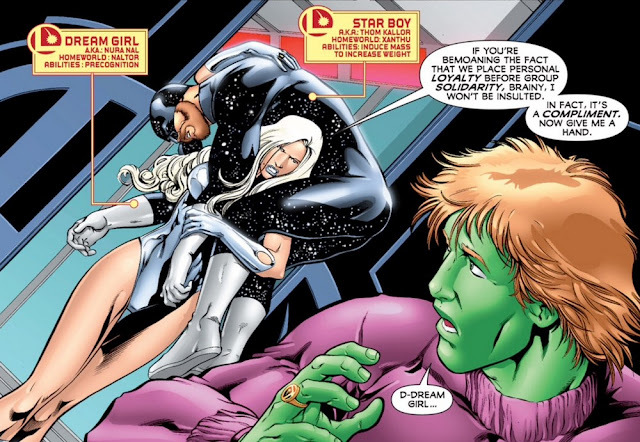 Brainy grumpily works on Star Boy, prompting Dream Girl to question if he really cares about any of them at all. Lightning Lord and Atta are finishing up some old fashioned recruiting by death match, when Colossal Boy and Phantom Girl interrupt. Not wanting a prolonged fight when there are certainly more Legionnaires on their way, Lightning Lord retreats with Atta, leaving their newest recruit to Ultra Boy. Brainy continues the multiversal energy drain, in hopes of curing Star Boy’s mental state. He leaves Dream Girl to monitor the process, and Harmonia Li to explain herself later, as Colu takes priority. On Colu, Saturn Queen and her Legion are slaughtering Coluans, in an effort to gain access to their data-mining links. Questor is unable to find any information on a world of the wise, so Saturn Queen pulls the information out of the mind of his uncle. 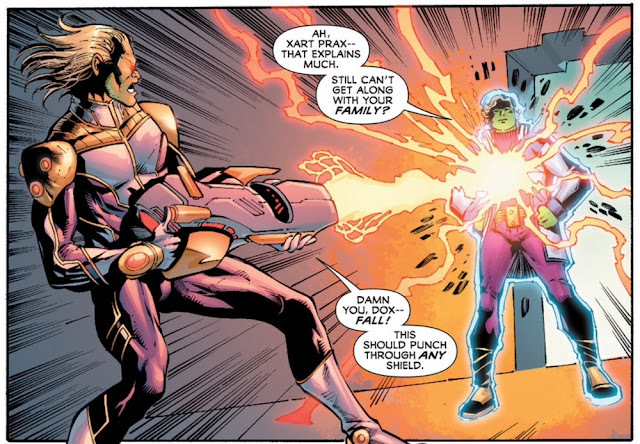 Ultra Boy and Phantom Girl catch up to Lightning Lord and Atta. 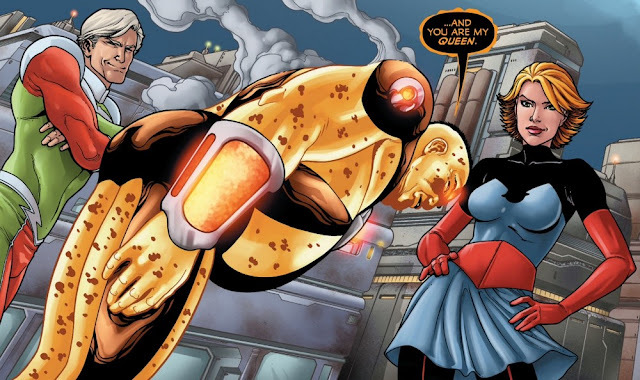 Mekt gets the drop on Ultra Boy, and Phantom Girl introduces her foot to Atta’s face. Phantom Girl checks on her boyfriend, while Lightning Lass faces off against her older brother. (I love a good sibling fight!) Zymyr arrives just in time to teleport Mekt and Atta away. Dyogene and a projection of Mon-El inspect the remains of the Rock of Eternity, as they continue to investigate their mysterious adversary. Meanwhile, Brainy and his team arrives on Colu. While the others assist the Coluans outside, he promptly tracks down Saturn Queen’s Legion, and makes quick work of Questor. Earth-Man arrives to help Brainy against Saturn Queen, but with her enhanced powers she easily takes control of their minds. Zymyr ports in to take her and Questor away, to the coordinates they gleaned from the mind of Questor’s uncle. Lightning Lord and Atta stay behind, to take on the Legionnaires, and distract them from Saturn Queen’s true goal. Which Legionnaire will die? Come back next week for the exciting finale to this volume of the Legion of Super-Heroes.